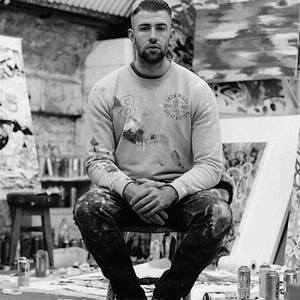 Born 1989 in Southampton and a resident of London, England since 2009; Self taught he uses painting as coping mechanism for grief Working in abstract and portraiture, painting free hand using knifes and brushes. Elmo has been able to create a unique and colourful style combining collage, oils, acrylics and modelling mediums. His pieces are textured which makes them fascinating to touch as well as view. Elmo is well known for playing card collages which claimed him internet stardom in 2013 when one of his pieces went viral overnight gaining millions of shares and views as well as a vast celebrity following. His playing card pieces tell a story of love, heartbreak and betrayal which have humanised playing cards in a way that has never been seen before. Over recent years Elmo has exhibited artwork in the galleries of London, Paris, New York, Bahrain Miami, Ibiza and Munich as well as having his work auctioned off at the Houses of parliament. Publications to date include GQ, Glamour Magazine, City AM, Wall Street International, Sloane Square Magazine, London Live, Neon Magazine, The Daily Echo, Epsom Guardian and Made in Shoreditch Magazine Elmo supports the following charities- Teenage Cancer Trust, Blood Wise, Unicef, British Red Cross, Cystic Fibrosis trust, Cancer Research Uk and Temwa.